Maxi Moralez (second from left) celebrates his goal. USA Today Sports. 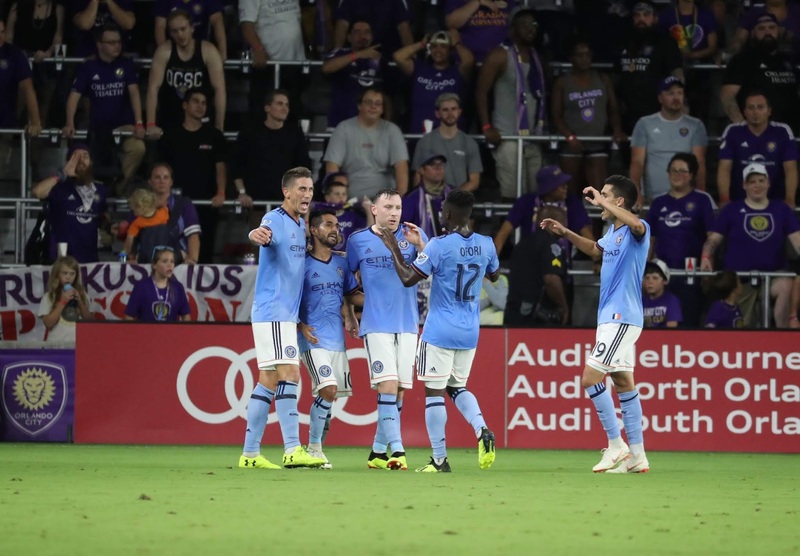 New York City Football Club earned their fourth straight victory, as they used two late goals in the first half to earn a 2-0 win over Orlando City on the road Thursday night. The shutout Orlando gives NYCFC and goalkeeper Sean Johnson a club record four-successive clean sheets. They also stretched a club-record 398 minutes without conceding a goal streak. This was NYCFC's first win on the road since March 31, and it put them back into second place in the Eastern Conference, as they improved to 13-4-4, with 43 points, just one point behind Atlanta (13-5-4, 44 points) for the top spot in the East, and two points ahead of the Red Bulls (13-2-5, 41 points). 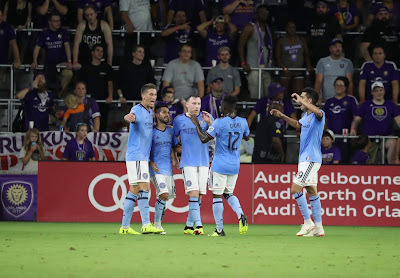 NYCFC got on the board in the 40th minute when Maxi Moralez buried a rebound off a post shot from Rodney Wallace’s pressing created chaos at the top of the box. This was Moralez's eighth goal of the season, tying him for the team lead. In the first minute of extra time of the first half, Anton Tinnerholm came up with yet another goal from full-back, cutting inside and slotting into the far corner with finesse from the corner of the box. This was Tinnerholm's fourth goal of the season, a NYCFC club record for a defender. Tinneholm said of scoring goals in back-to-back games, "On goals in back to back games, "Different corners, but I came from the right and got a good ball this time from Maxi [Moralez] and pretend to shoot, and then I got the ball on my left foot and put it in the left hand corner. So, felt good and was important for us that we got the goal late in the first half. The other one against Columbus (on July 14) was also late in the second half, was also important. Yeah, it was similar goals, but different corners." Orlando City's best chance of the night came in the 62nd minute when Dom Dwyer got off a big shot from just outside the box, but Johnson raced out to make the save.